Peacock Visual Arts is proud to exhibit at this weekend's 6th Aberdeen Art Fair, which takes place from Friday to Sunday at the City's Beach Ballroom, maintaining the organisation's record of being at every fair since its inception. To celebrate this year's AAF, Peacock Visual Arts invited local cult artist and Dons fan Richie Mutch, whose nephew Robbie is on the books at Pittodrie, to publish a new work in conjunction with PVA. 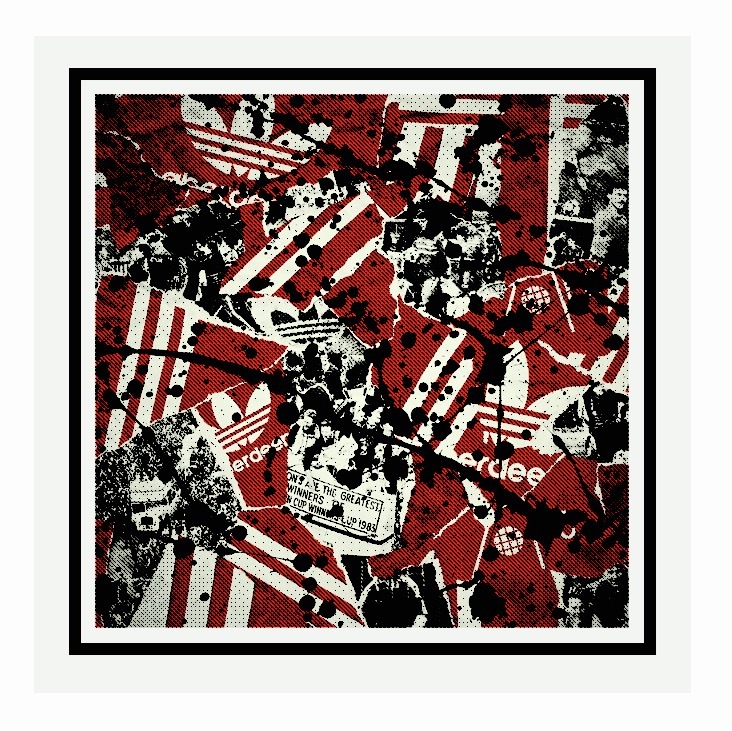 Consequently, being released exclusively for the AAF is a brand new screenprint 'One Love', highlighting Aberdeen's love for Retro Adidas, The Stone Roses, and of course defeating the Galacticos on their way to the historic 1983 European Cup Winner?s Cup triumph. 83 prints are available to buy this weekend at the Beach Ballroom costing £150 each. One of the numbered prints, number 19/83 will not however be on sale as it is being gifted to the Club and the AFC Heritage Trust! A spokesman for AFC Heritage Trust observed: "This is a welcome addition to The Aberdeen Collection. There is a growing body of Aberdeen FC related artworks and we are delighted to accept them into our care. We hope that we can organise an exhibition of our own before too long." Peacock Visual Arts will also be showing a new limited edition screenprint by Frances Walker, titled 'On The Way To Cruden Bay', a work inspired by a previous expedition by a group of artists who walked along the coast to Cruden Bay to research for a BP mural commission, and the 'Wish You Were Here' commemorative blue plaque, which was made at Peacock Visual Arts to celebrate Pink Floyd's 1967 performance at the Aberdeen Beach Ballroom. Now in its 6th year, the AAF is the perfect event for art lovers, with prices of original contemporary work ranging from £50-£10,000. Visitors can expect to see work by household names, celebrities, local, national and international talent, emerging artists and many award winners. Many artists will feature fresh new work straight from the studio and there are pieces especially commissioned for the AAF. In addition, on the Saturday and Sunday, there is a free Children's Art Club where youngsters can try their hand at all types of art. The Aberdeen Art Fair's official charity partner is The Archie Foundation with a silent auction and raffle being staged over the event and all proceeds going to the charity.